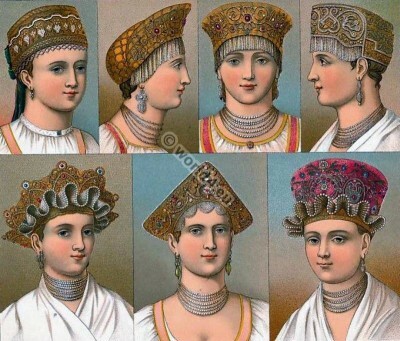 Traditional Russian headwear by Auguste Racinet. This entry was posted in 19th Century, Headdresses, Russia and tagged Auguste Racinet, Russian national costumes on 12/29/15 by world4. Historical Turkish male and female costumes. 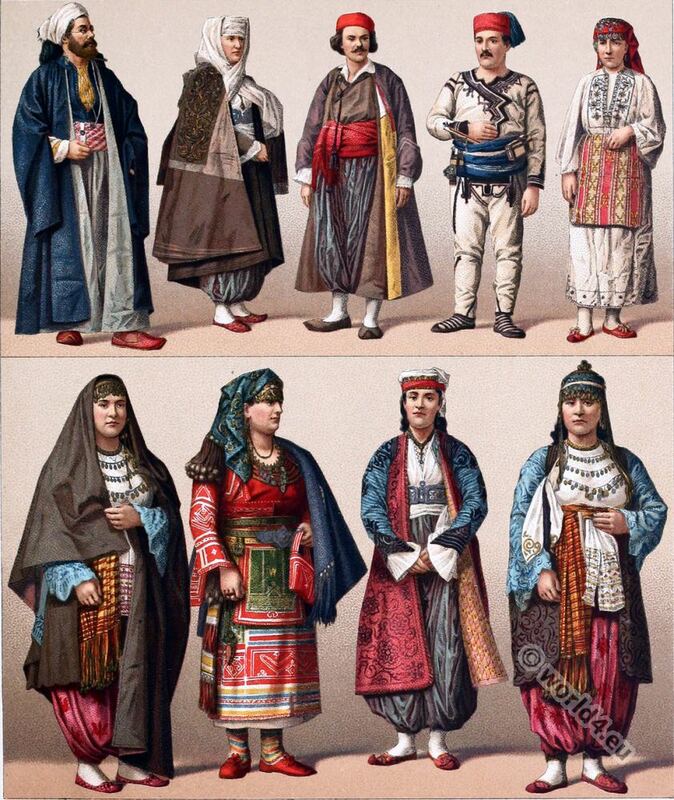 Historical Turkish male and female costumes from the european part of the Ottoman Empire. This entry was posted in 19th Century, Ottoman Empire, Traditional, Turkey Costumes and tagged Auguste Racinet, Ottoman Empire costumes on 7/8/15 by world4. 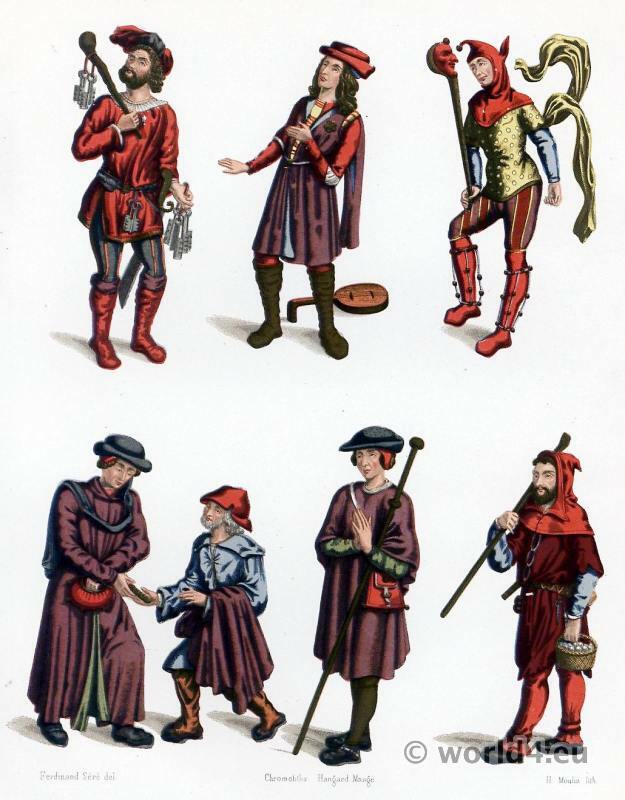 16th century German renaissance costumes. Women wearing hats, Germany, 16th century. This entry was posted in 16th Century, Germany, Headdresses, Renaissance and tagged Auguste Racinet, Renaissance fashion era on 1/11/15 by world4. France Gothic medieval dresses, 15th century. Jailor; Menestrel; Fool; Bourgeois; Beggar; Pilgrim; Shepherd. Extracts from the Danse Macabre. Costumes of Jailor, Menestrel, Fool, Bourgeois, Beggar, Pilgrim, Shepherd. This entry was posted in 1490, 15th Century, France, Middle Ages and tagged Auguste Racinet, Gothic costumes, Medieval costume on 12/28/14 by world4. French Farmer and villager, maid, fiddlers in 15th century. Farmer and villager, maid, fiddlers, 15th century. Dance of the Dead. Medieval burial scene. 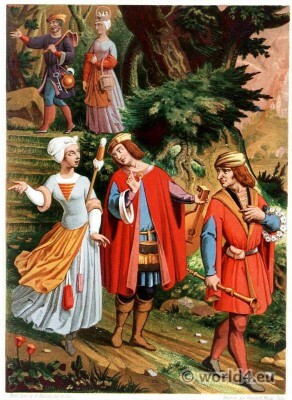 Gothic period, late medieval costumes. From the book: Les arts somptuaires: Histoire du costume et de l’ameublement et des arts et industries qui s’y rattachent. Paris: Hangard-Maugé, 1858. Author: Charles Louandre (1812-1882). Artist: Ferdinand Seré (1818-1855). Lithographer: Auguste Racinet. This entry was posted in 15th Century, France, Genre, Middle Ages and tagged Auguste Racinet, Gothic costumes on 12/28/14 by world4. 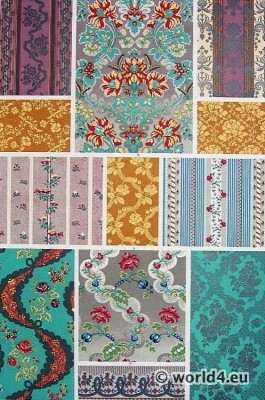 18th century fabrics. French Silks hanging patterns. 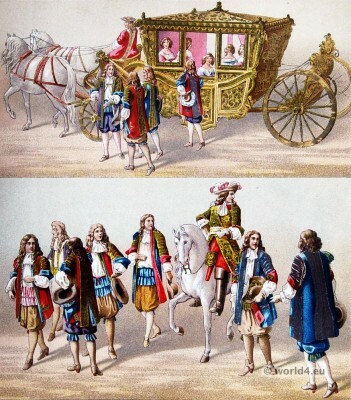 The silks, the designs for which form the subject of our plate, all come from that branch of French manufacture to which Golbert, under Louis XIV, gave so powerful an impulse, and the productions of which, thanks to careful academical studies, and the wholesome traditions of the studios, have never ceased to influence all title European manufactories engaged in the production of these fabrics. The twelve examples given in title accompanying plate may be classified in the following order. To this classification we have added a scale showing the relative proportion of each to the original (the patterns are shown reduced from their original size). 4. Border (Louis XVI) – Fig. 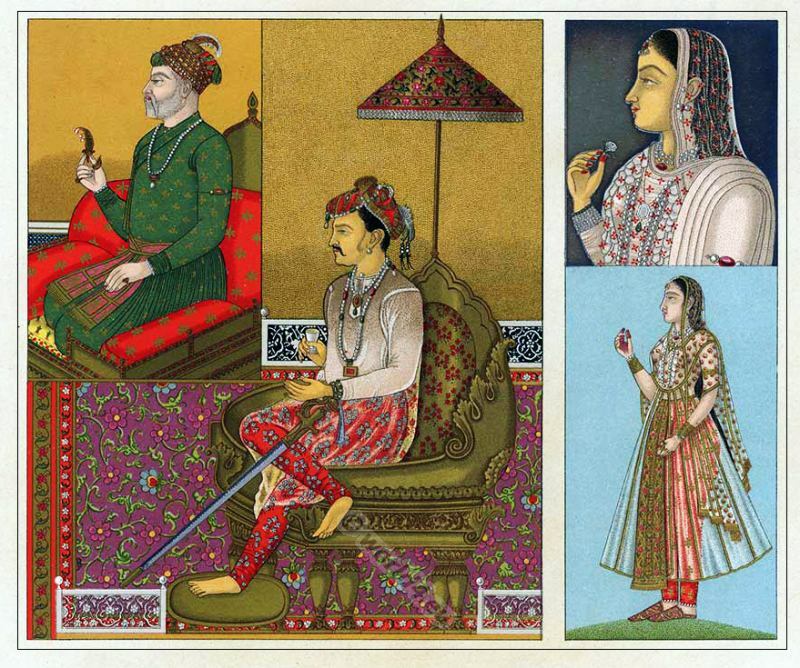 12, In the first four of these, traces of the influence of Asiatic art on the national taste may be observed. Numbers 3 and 4 deserve special attention from the manner in which by means of reflected rays richness and fulness are imparted to the primary simple designs. 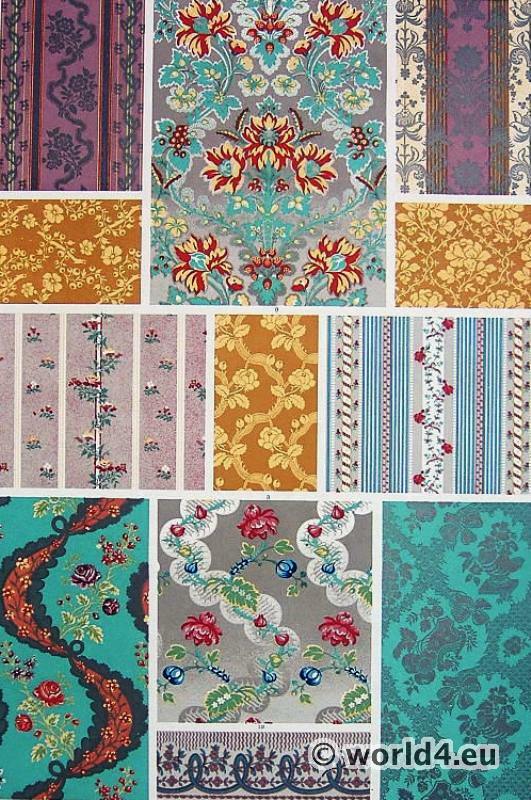 Lastly, as a peculiarity in the process of manufacture, we notice in Numbers 2, 3, 4, 10, 11, the use of silks figured with zonal patterns. This entry was posted in 1740, 18th Century, Ancien Régime, Fabric, France and tagged Auguste Racinet on 12/28/14 by world4. 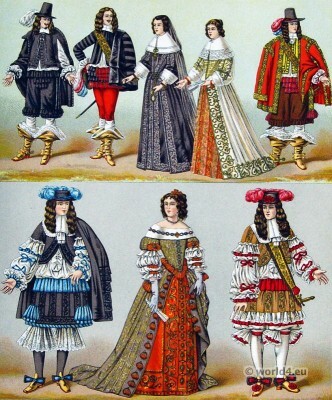 French costumes 1646 to 1670. Louis XIV, Ancien Régime, Baroque period. This entry was posted in 1646, 1670, 17th Century, Ancien Régime, Baroque, Court dress, France, Nobility and tagged Auguste Racinet, Baroque fashion on 4/22/14 by world4. Versailles. 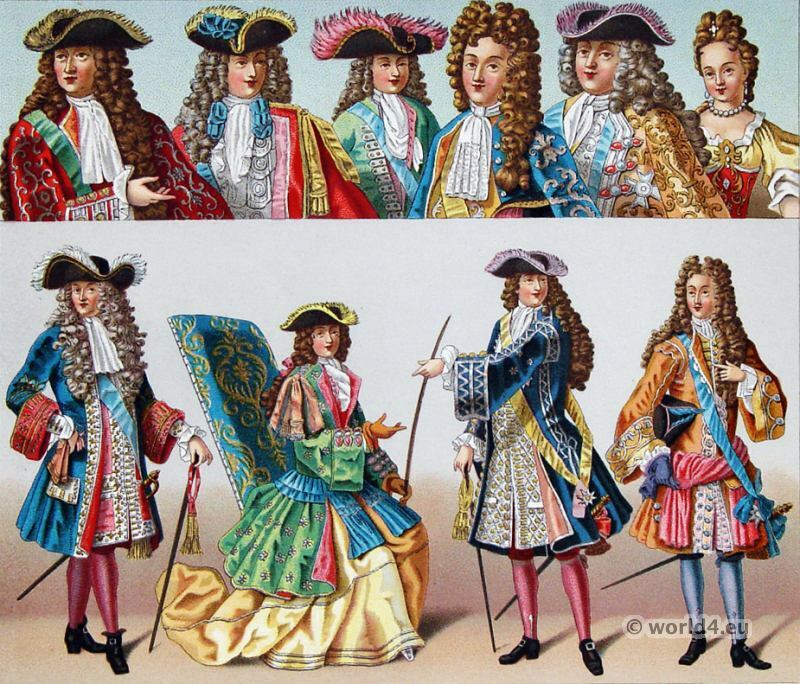 Louis XIV fashion. Ancien Régime. France – 17th century. Court dress. Versailles. Nobility. 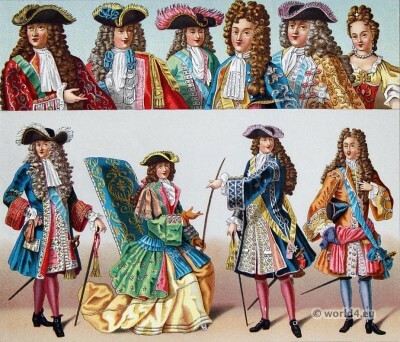 This entry was posted in 17th Century, Ancien Régime, Baroque, Court dress, France, Nobility and tagged Auguste Racinet, Baroque fashion on 4/22/14 by world4. Entry of Louis XIV and Maria Theresa into Arras. The Entry of Louis XIV and Maria Theresa into Arras 1667. 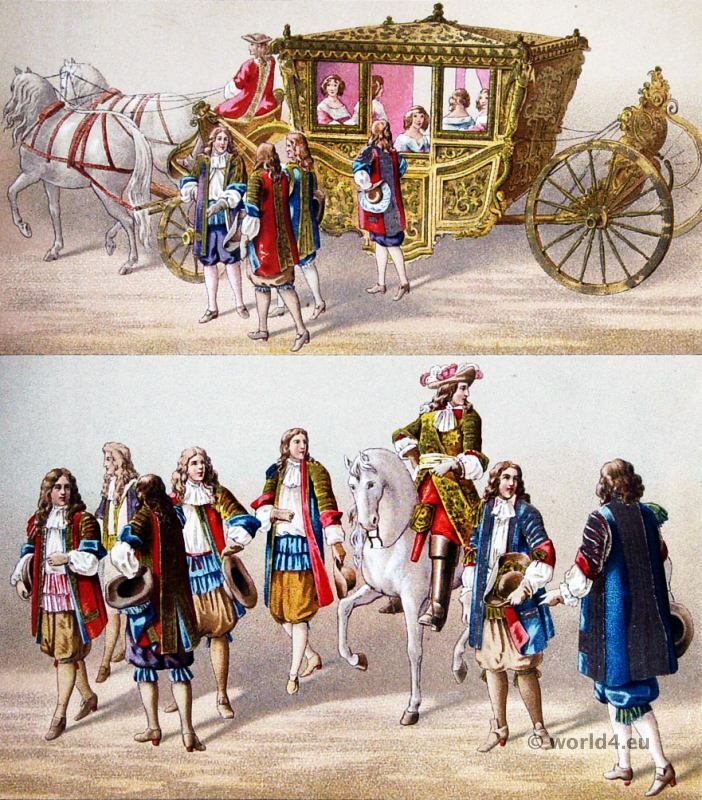 The chariot of the French Queen Maria Theresia (1638-83). 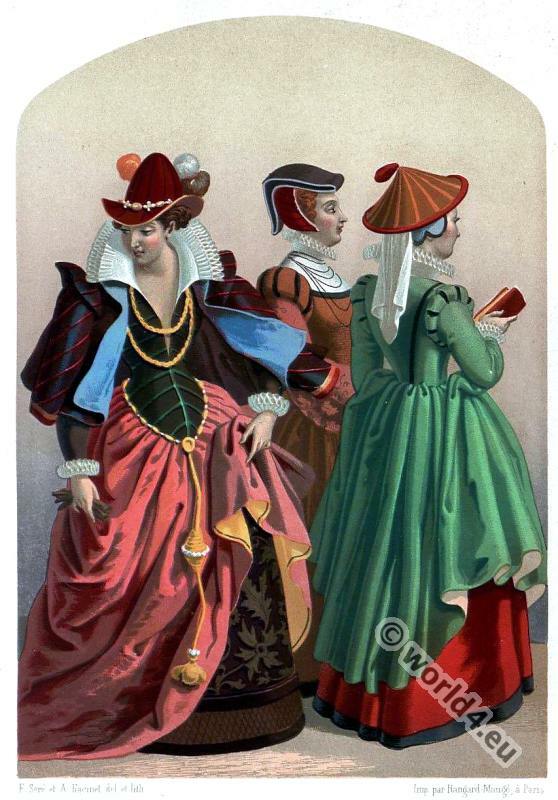 This entry was posted in 1670, 17th Century, Ancien Régime, Baroque, Court dress, France and tagged Auguste Racinet, Baroque fashion on 4/22/14 by world4. ‘Le Costume Historique’ by Auguste Racinet. Lithographed by Chataignon for Firmin Didot. Paris 1876-1888. This entry was posted in 16th Century, Afghanistan, Asia, India, Nobility and tagged Auguste Racinet, Paul Louis de Giafferri, Traditional India costumes on 9/9/13 by world4. The Motrebs. Persian dancer and musicians, 16th century. Persian dancer and musicians costumes in the 16th century. 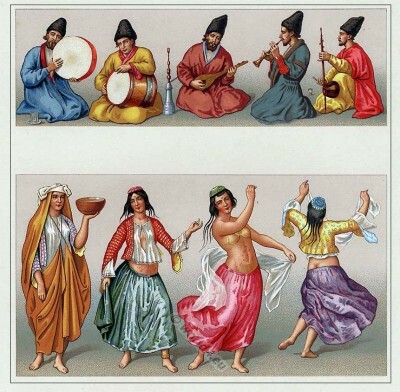 This entry was posted in 16th Century, Asia, Middle Ages, Persia, Traditional and tagged Auguste Racinet, Dance costumes, Firmin Didot, Musicians on 9/8/13 by world4.